Our 2018 Road Trip, Part 2: Searching Through Hayes Stacks « Midlife Crisis Crossover! Attorney. Courtroom defender for runaway slaves. Union Army veteran. Congressman. Social reformer. And, when time permitted, American President. Not every U.S. President left an institution behind upon their passing. Some have multiple cities named after them. Many have a museum that tells their life story and/or celebrates their contributions to their homelands. Some states are prouder of their famous citizens than others. 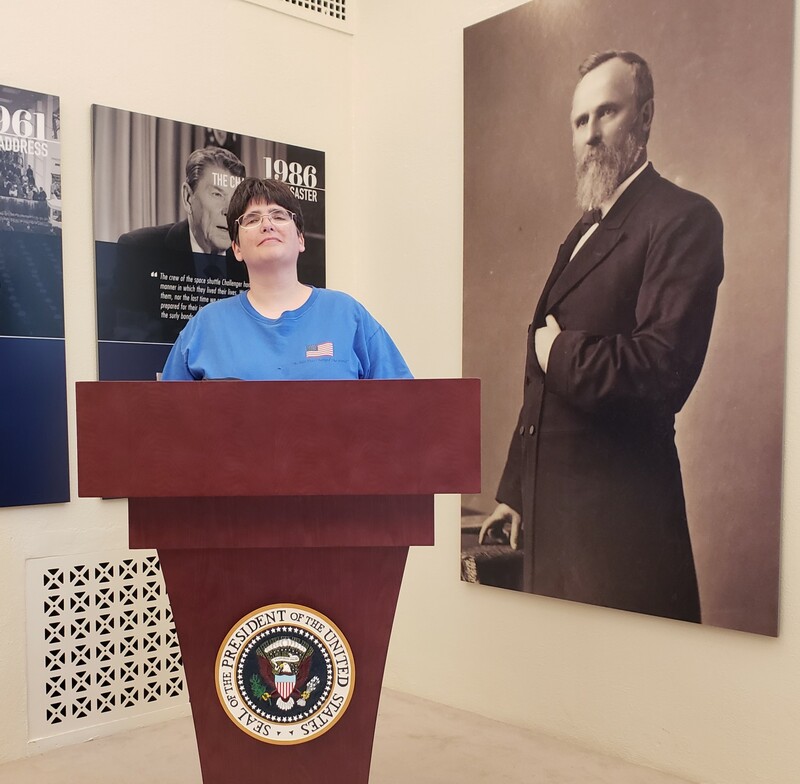 A number of our former leaders have eponymous presidential libraries, though most were established in or after the 20th century, well after they and their immediate family died. You’d think the very first fully dedicated Presidential Library would have been in honor of one of the really cool Presidents — the ones who get movies made of their lives, who get to be played by upright actors like Sam Waterston or David Morse. Nope. This guy’s was first. We’re not talking a one-room shack run by a lonesome intern. We’ve visited our share of those museums. 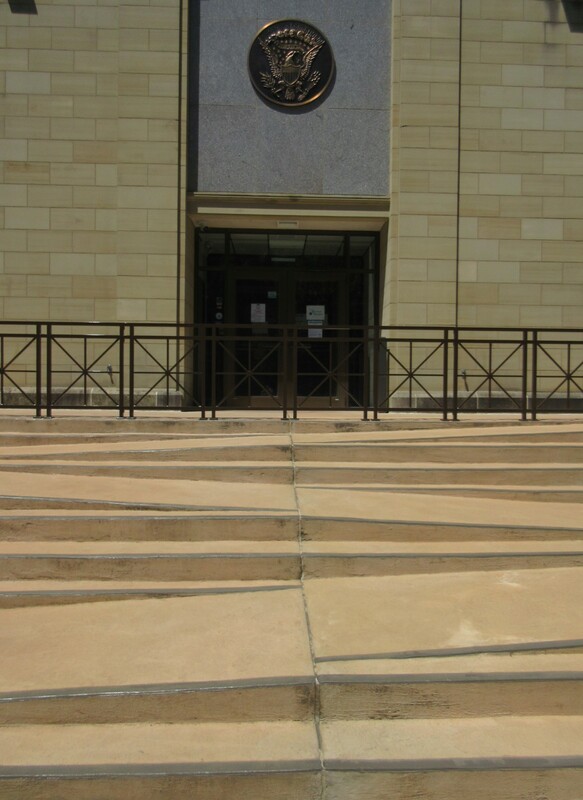 Leading to the entrance is a wide staircase made of sideways ADA ramps laid out serpentine style. Ask any average passerby anywhere but Ohio who their favorite President was; if they name Rutherford B. Hayes, it’s because their minds suddenly went blank and his was the first name that popped in at random. His administration certainly got off on the wrong foot — Hayes lost the popular vote but took the Electoral College. 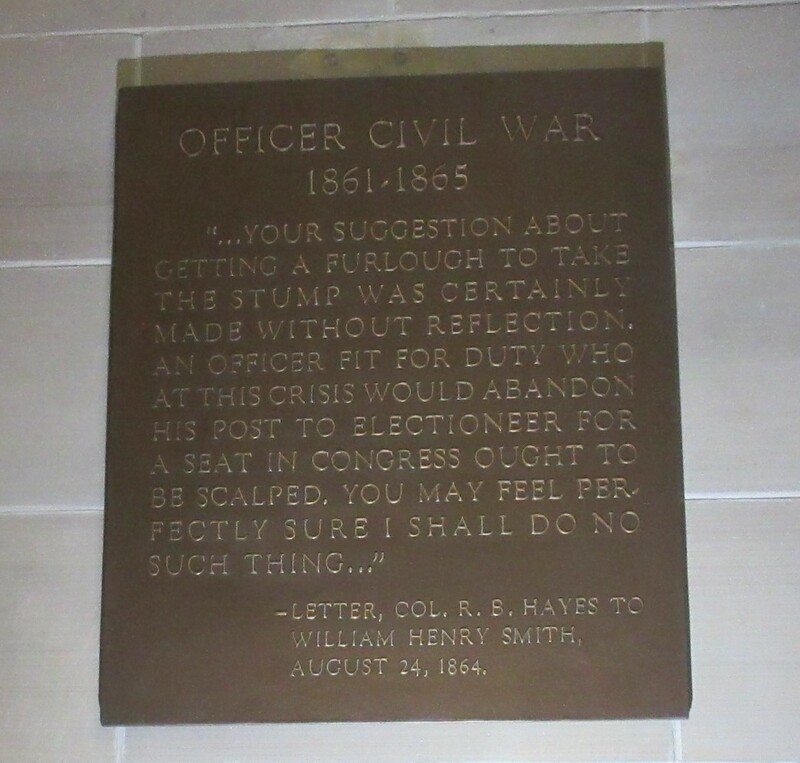 To call it “winning” is inaccurate — in the infamous Compromise of 1877, negotiations behind closed doors gave Hayes the minimum electors he needed to win, in exchange for pulling all remaining federal troops from the South, effectively ending Reconstruction in one fell swoop and leaving millions of freed slaves without anyone to defend them from all those Civil War sore losers who once owned them. Three cheers for 19th century political corruption. And bipartisan, at that. 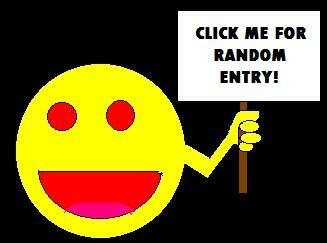 In his defense, before and after that ignominious kickoff, Hayes pursued righteous causes throughout his lifetime. He proudly defended runaway slaves in court in his early lawyering days. He was wounded five times in the Civil War as he rose through the ranks of the Union Army. He helped pave the way for the founding of Ohio State University. He was a member of the Congress that passed the Fourteenth Amendment. Meanwhile on the side, he was also an enthusiastic archivist, by which I mean he saved everything. 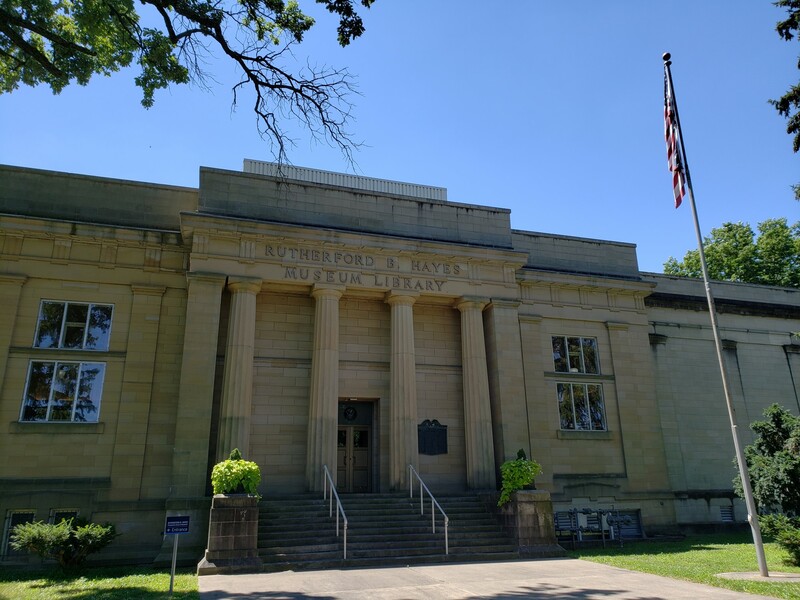 The officially dubbed Rutherford B. Hayes Presidential Library & Museums at Spiegel Grove, established in 1916, is and was made possible through a nonprofit organization in association with the State of Ohio, but it was also made possible by the enormous number of collections, souvenirs, gifts, documents, and things in general that were in his possession upon his passing. We were interested in seeing his gravesite in the lovely park out back, but we were also happy to find that Hayes’ museum contains an above-average number of genuine items from the Hayes Presidency, as opposed to well-meaning but less awe-inspiring replicas. We’ve become the kind of weary travelers who roll their eyes whenever a given museum shows us too many artifacts that are like some actual artifacts that they totally don’t have. 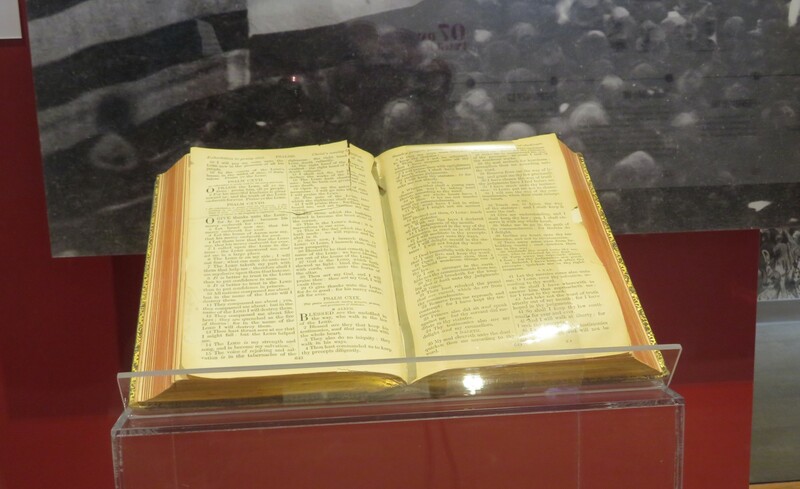 The Bible used at his inauguration. A bona fide Inaugural Plank, embellished by some Hayes superfan. Back in the day, U.S. Presidents had to pay for their own transportation. 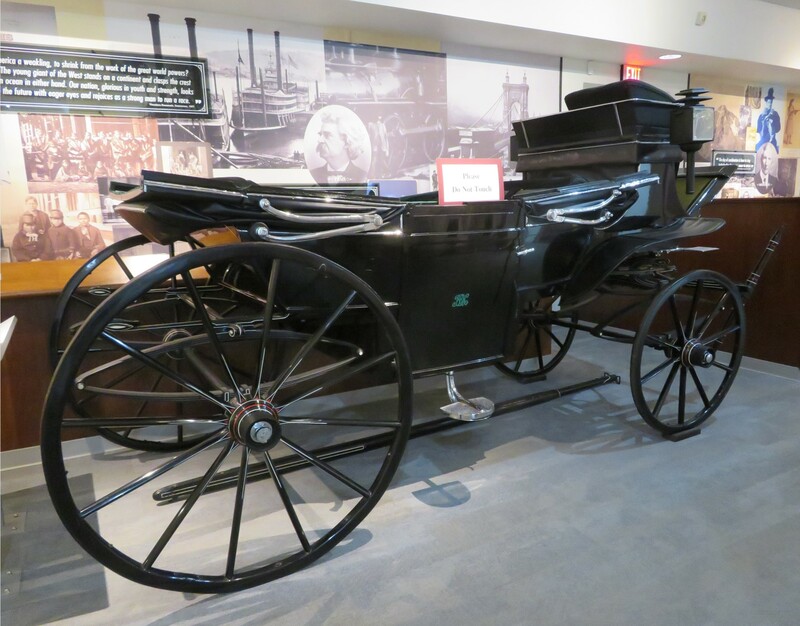 This carriage, including horses and accessories, set Hayes back $2500. 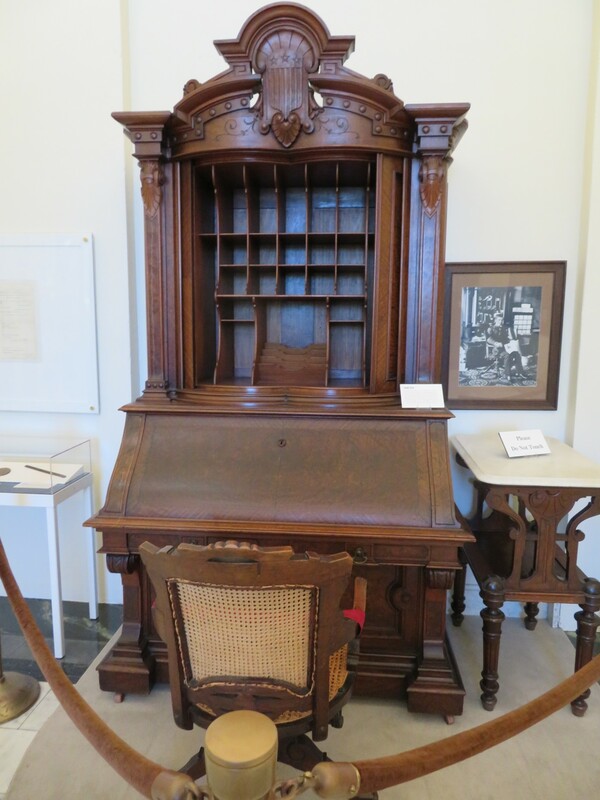 Hayes’ old desk, which his son Webb Cook Hayes bought in 1903 when the White House had some of its excess furniture auctioned off. 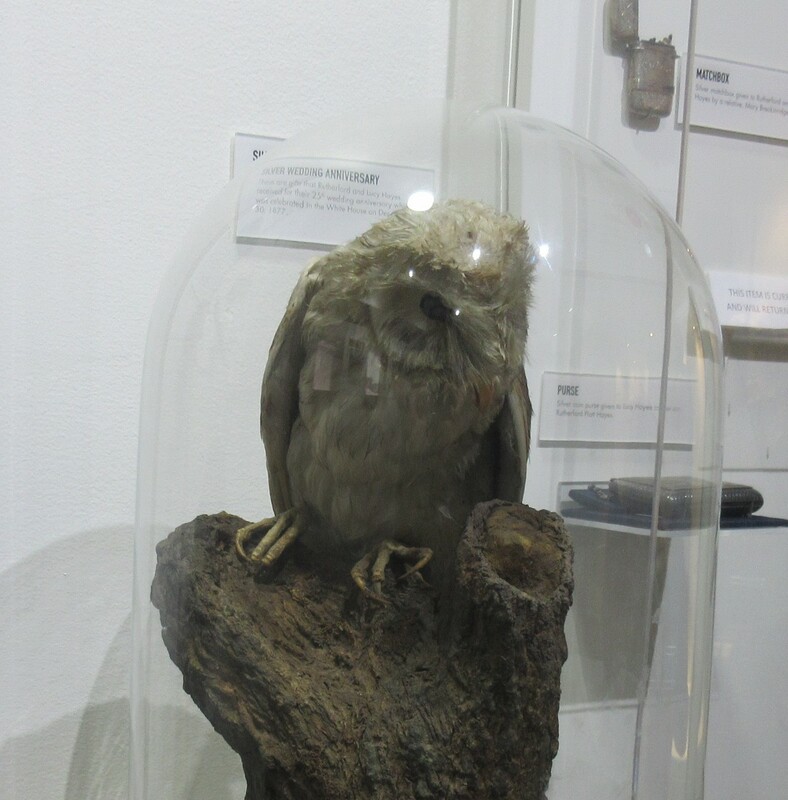 This owl was caught alive inside the Washington Monument in 1879. Upon its passing, it was stuffed and gifted to Hayes. 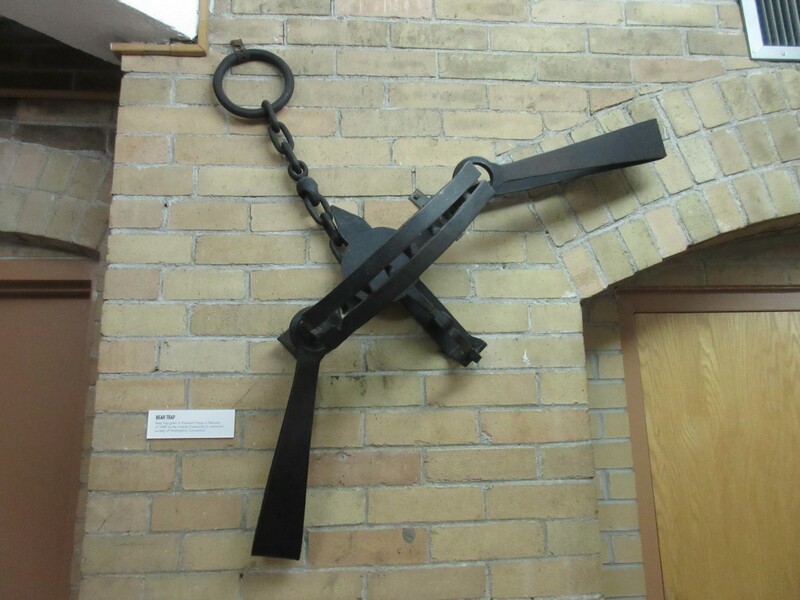 This bear trap was an 1880 gift from a Connecticut commune. 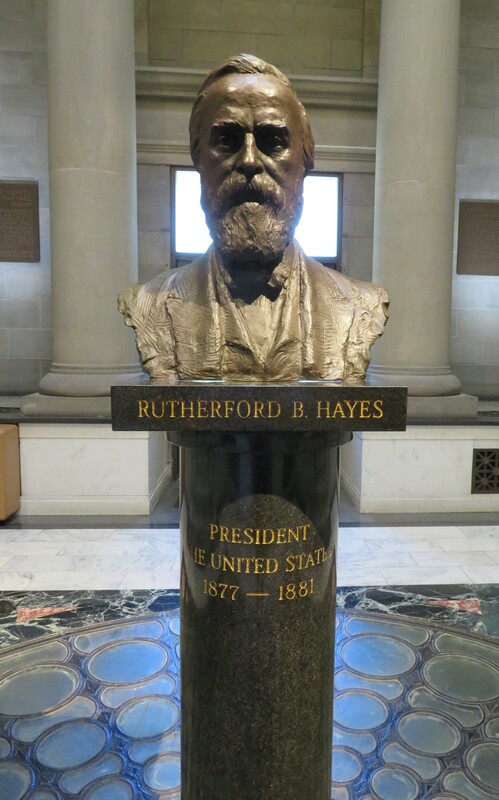 The Hayes bust in our lead photo was in a lower-level rotunda whose decor included plaques with Hayes quotes. 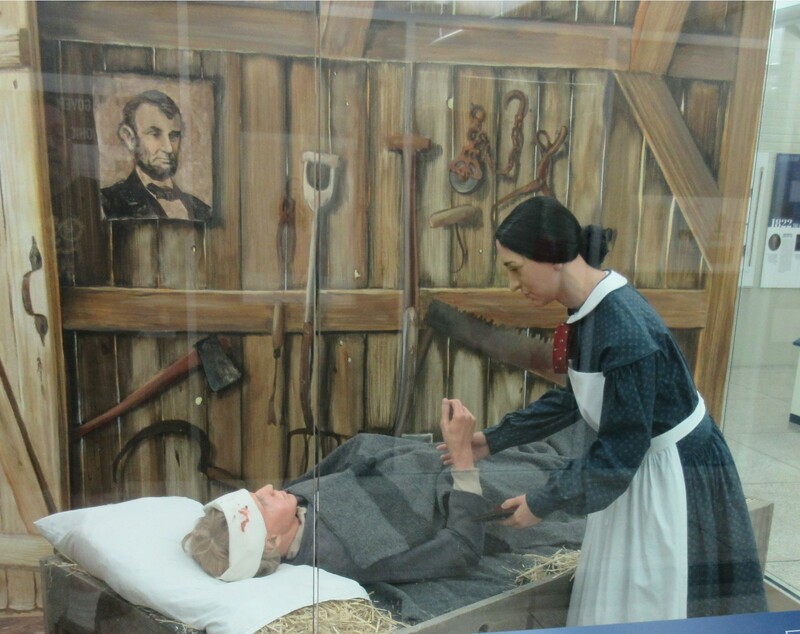 A select number of mannequin-enhanced dramatic reenactments include the time his wife Lucy Webb Hayes traveled to tend to his injuries after the Battle of South Mountain. Upon seeing that he was already in good hands, she volunteered to assist other wounded soldiers instead. 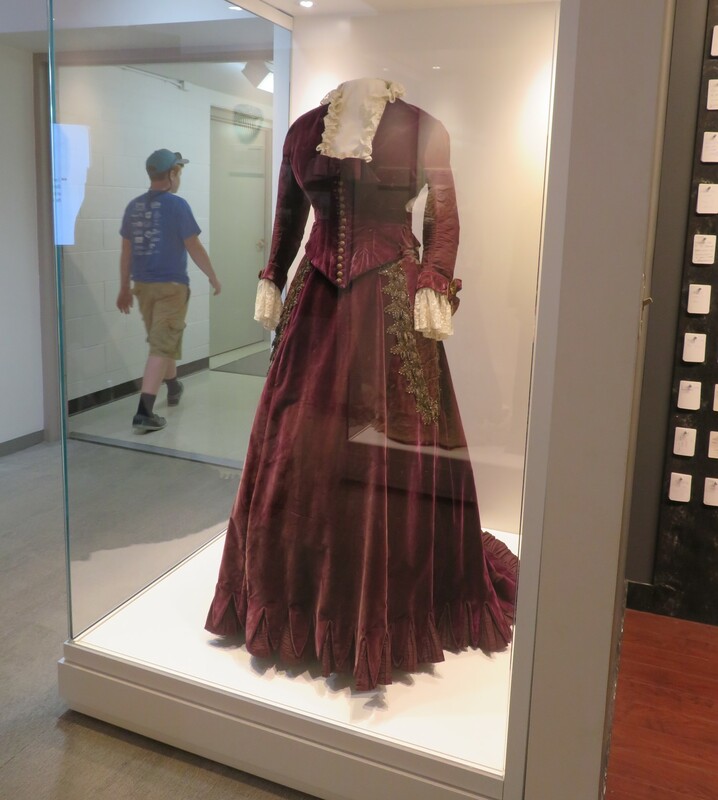 The dress Lucy wore in some of her official First Lady paintings. Rutherford and Lucy had eight children, seven of them boys. 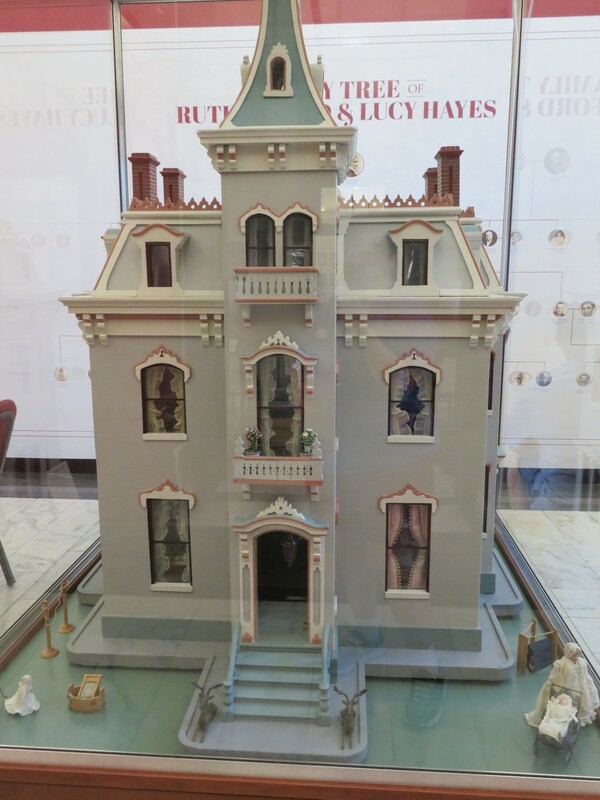 This dollhouse belonged to lone daughter Fanny. A selection of the kids’ possessions. 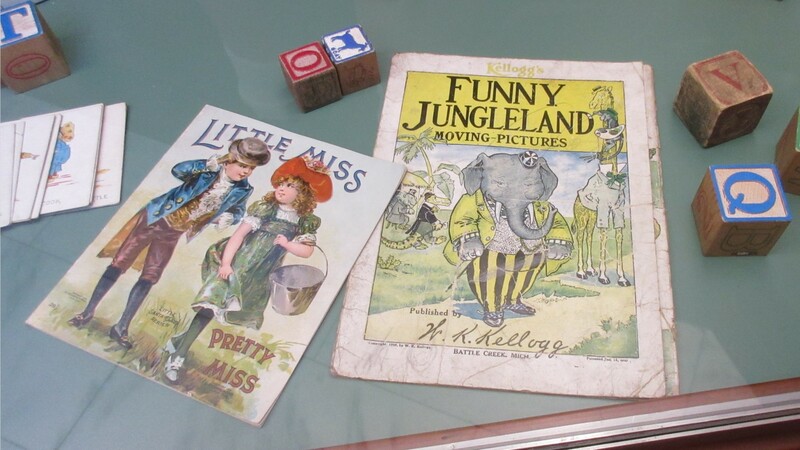 Curiously, this wasn’t the first time I’ve seen a copy of Kellogg’s Funny Jungleland Moving Pictures in a display case. 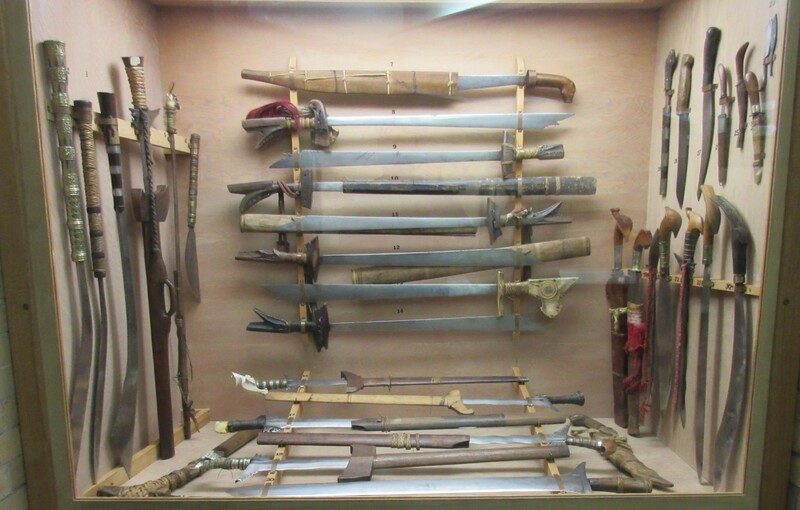 Another room contained dozens of weapons that belonged to Webb Cook Hayes, accumulated throughout his various military stints overseas. This is just the bladed section. 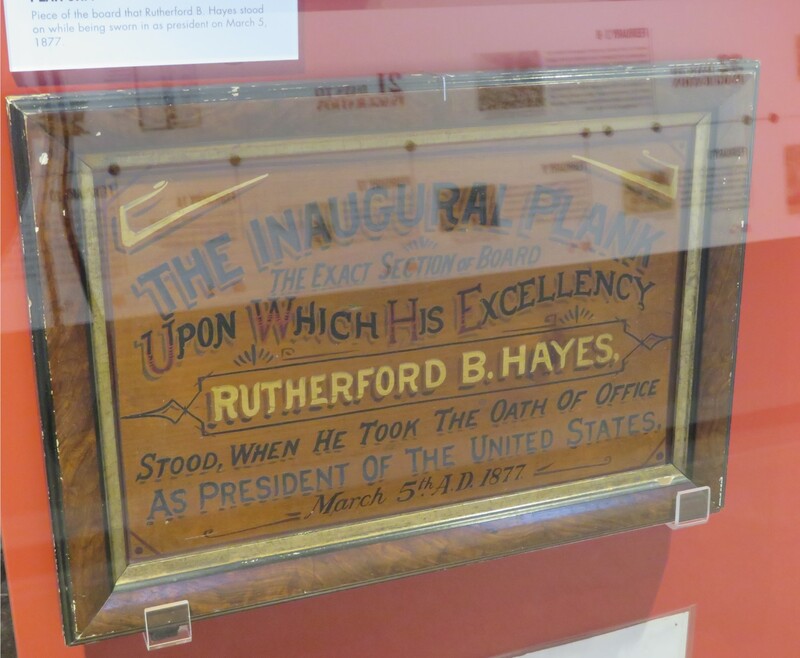 Not merely content to celebrates Hayes’ life and accomplishments, still another room of his museum contains mementos from other Presidential administrations, including an entire wall devoted to Presidential autographs on various forms of correspondence. The museum doesn’t exist merely in a vacuum for the locals; its achievements in historical preservation have been noticed and appreciated by others at the top. 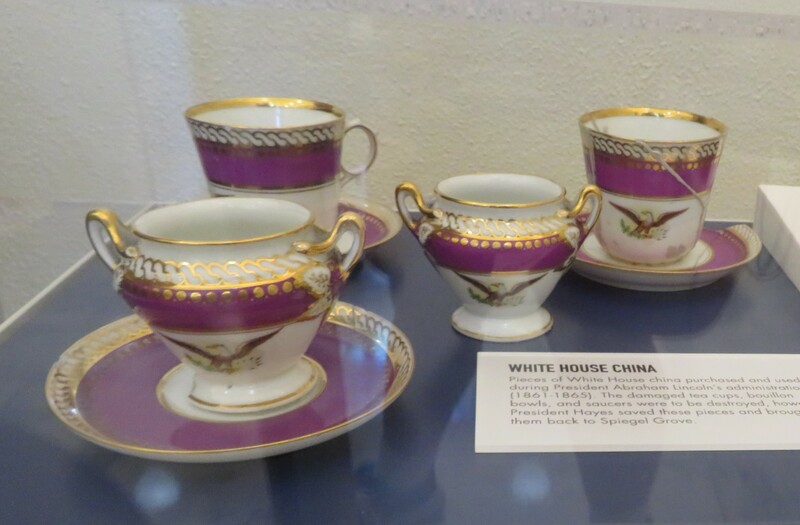 Abraham Lincoln’s damaged White House china, which the Hayeses took with them when they moved out rather than discard. 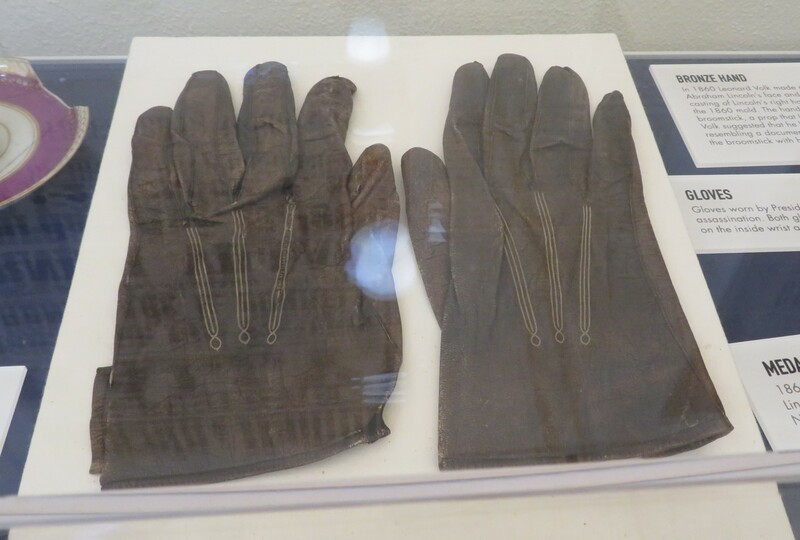 The gloves Lincoln wore to Ford’s Theatre on the night of his assassination. 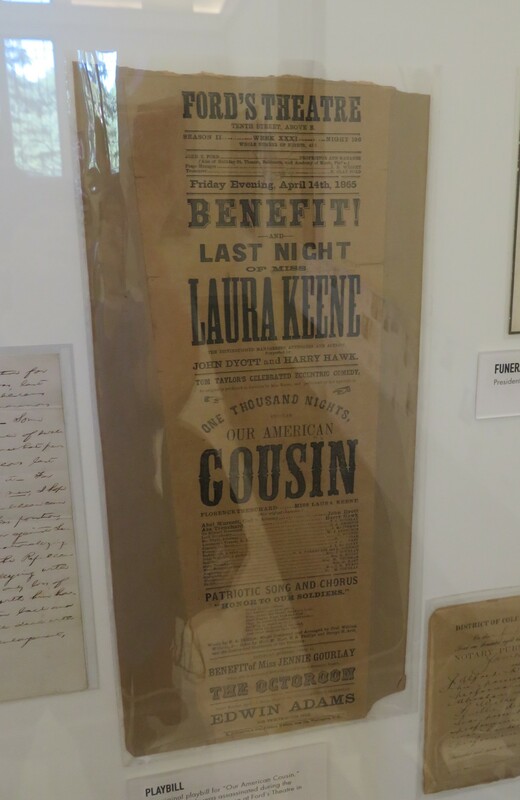 Playbill for Our American Cousin, Ford’s feature presentation on the evening of April 14, 1865. President Hayes, resembling a bearded Viggo Mortensen, watches over Anne as she tries to improv her way through a State of the Union Address while the ghost of Ronald Reagan whispers dark commands in her ear. Many of the Presidents’ autographs were inscrutable inscriptions. 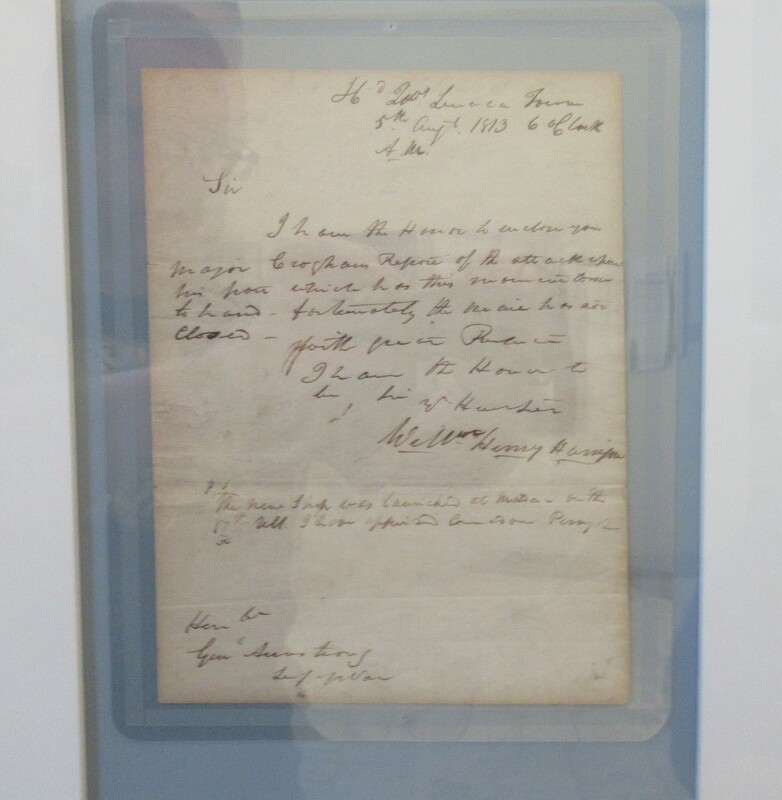 President William Henry Harrison’s was among the most legible. 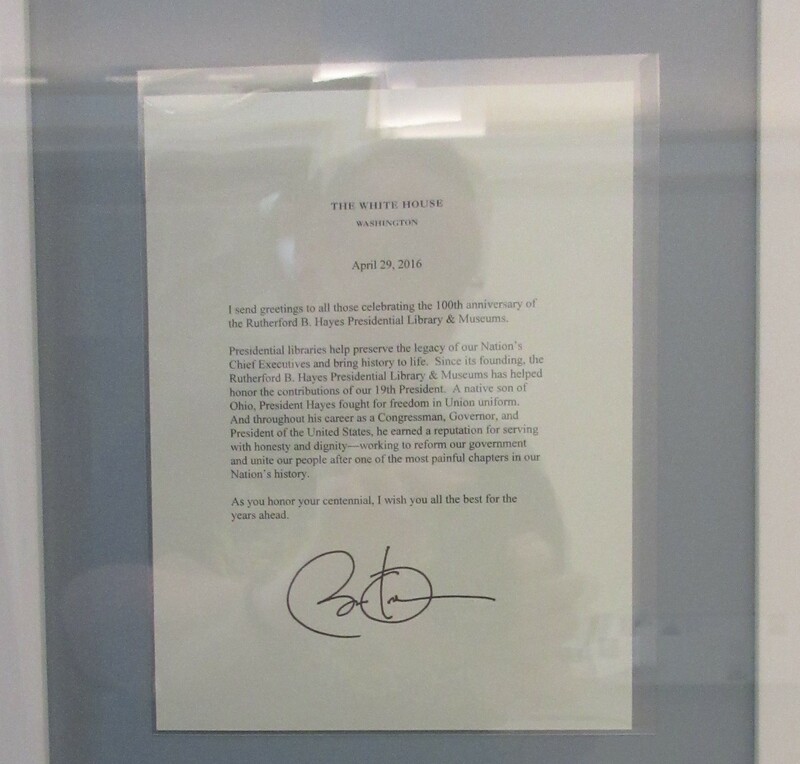 A glowing Hayes Museum endorsement from Yelp reviewer President Barack Obama. 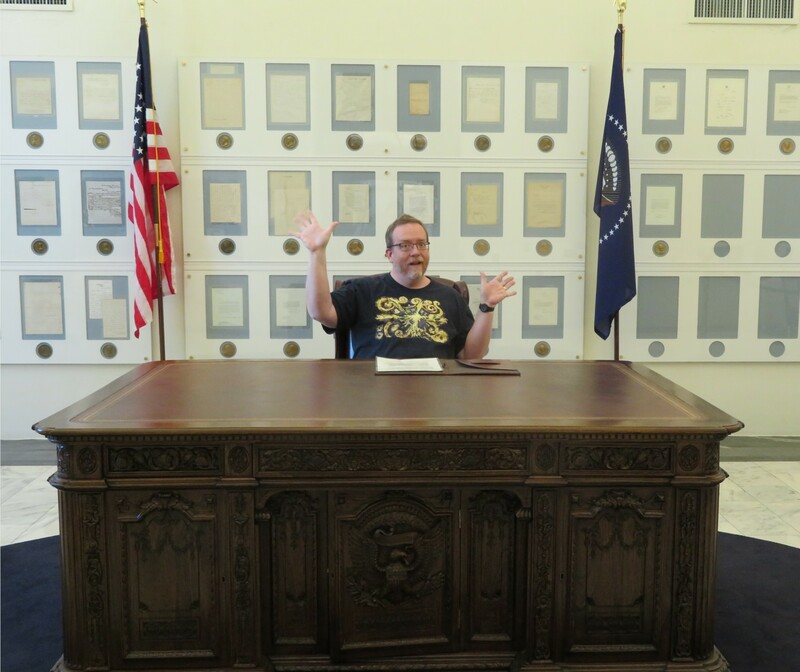 A replica of the famous Resolute Desk, an 1880 gift to President Hayes from Queen Victoria herself. The original remains in the White House today and has been used by every President from Clinton to the present. …okay, so it’s fair to say replicas have their uses and aren’t all bad.